One great example of this came at the end of 2014, when the Insurance Institute for Highway Safety put all 2015 model year minivans through their series of crash tests, and the Odyssey was the only one to earn top marks in the extremely challenging small front overlap crash test. The test, designed to simulate a single-car accident against a tree or utility pole, is designed to help consumers buy vehicles that hold up well in as many different types of potential accidents as possible. Since the aforementioned single-car accidents are responsible for approximately a quarter of all crashes in the U.S., the small front overlap test is an important one to pass, and Honda was one of only two minivans to do that (and the only one to ace it). 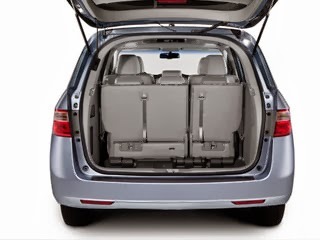 “As the only minivan to offer the highest possible IIHS-rated protection in small overlap crashes, car buyers can look to the Honda Odyssey to securely and safely transport what’s most important—their families,” said Art St. Cyr, VP of auto operations at American Honda Motor Co.
As a 2015 IIHS Top Safety Pick, the new Honda Odyssey is a family vehicle that protects families better than any other minivan in the industry. That’s certainly something to consider when shopping for a new minivan. It’s not just talk; this is one safe people pusher.